Do you suffer from dry skin during the winter? Our Soothing Dry Skin Balm is full of nourishing and hydrating ingredients that will soothe your dry skin! Winter can be a rough time for the skin. It has a greater tendency to dry out since the air is often quite dry, especially where we live in the mountains. For many people, this lack of humidity can cause flakiness and itchiness as well. 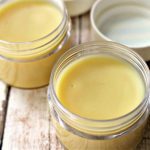 You can make your own salve at home with a combination of some good base ingredients that will help feed and nourish the skin, plus essential oils to help keep it happy and healthy. 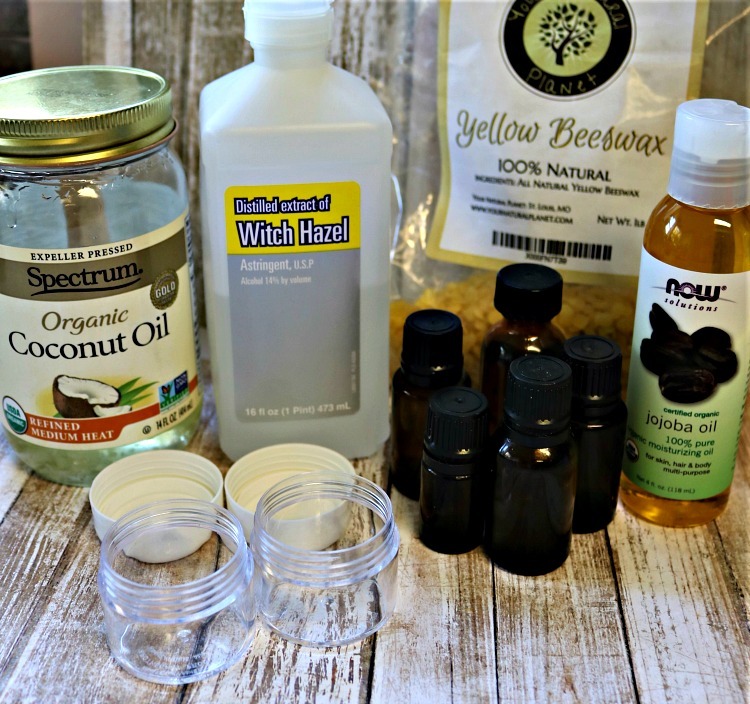 This recipe calls for five essential oils that make a powerful salve. All of them are wonderful for the skin and will result in a fantastic scent, but more importantly, just what your skin needs when it is struggling. This dry skin balm has a firmer texture because of the high ratio of beeswax. If you’re looking for something a bit softer, try our Calendula Lavender Skin Salve. I find it’s easier for the kids to work with, but not as portable as this balm. If you’re suffering from dry, itchy skin, we hope you’ll give this winter dry skin relief salve a try and let us know what you think! Start by setting out all of your containers that you’ll be filling with the dry skin salve. 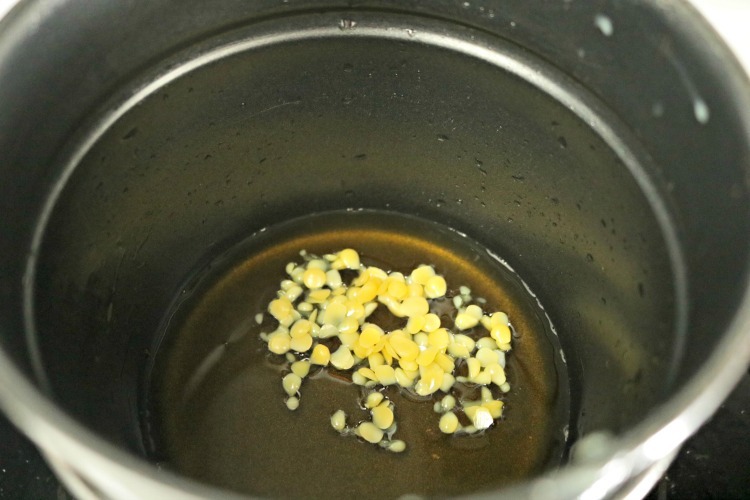 Place your pre-measured beeswax into the top half of a double boiler. Fill the bottom half about ½ to 2/3 full of water and place over low to medium heat. Heat the pan slowly until you hear it start to come close to a boil, then turn the heat down to low to where the water is simmering. 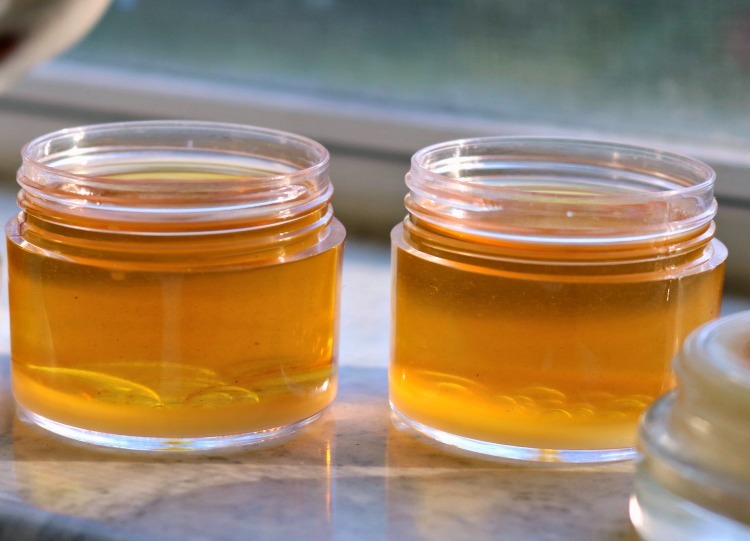 Once the beeswax has melted fully and is clear, stir in the coconut oil and jojoba oil and continue stirring until the salve is clear. Remove the pan from the heat and allow the mixture to cool just slightly (you don’t want it to harden! ), then you can add in the essential oils. The myrrh is a thick oil, and it takes a minute to get going, so be prepared for that. The rest of the oils are very runny, so be careful to not overdo it on the essential oils. Pour your dry skin balm into the containers until it reaches just under the top edge. Let the containers sit, uncovered, at room temperature until they are completely cool. Feel the centers of the bottom of the containers to tell for sure. It may take up to an hour, depending on the size of the containers you used. The containers I used were the 2-ounce size and it took close to an hour. You don’t want to put the lids on early, as it will cause moisture to build up inside which can cause issues with the balm down the road. Once you are sure the containers are completely cool, go ahead and put on the lids. They’re now ready to use or gift! Apply the balm to any areas of the skin that need moisture, or are flaky and dry. For itchy skin, do the same. You can repeat this process as needed, and if you are really having major issues, apply a drop or two of the recommended essential oils themselves on top of the salve as well and rub in. 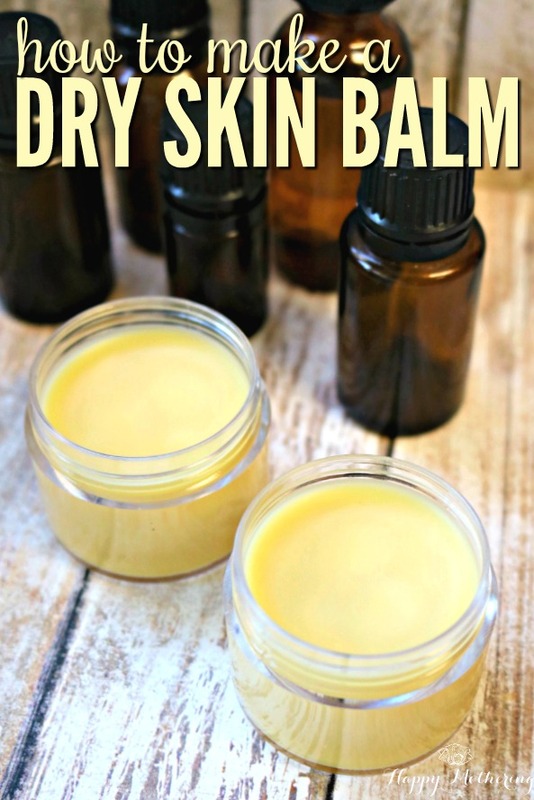 Let us know how you like this dry skin balm in the comments below! Pin this post to your DIY or Remedies boards! This looks inviting…and needed during the cold, dry weather! My hands get so dry during this time of year – your recipe is perfect!! 🙂 Thanks for sharing at the Friday Favorites linky party. I hope you’ll come back next week to link up your projects so I can stop by again! My balm turned out so hard and totally not spread-able ?. What did I do wrong? It feels like I’m trying to spread straight wax on my hands ? Do you know how many oz total this recipe makes. I need to calculate or my quantity and size of containers. It should be around 10-11 ounces. Thank you. I do not see on the directions where the use of the witch hazel comes in?